We are about to head to Disney World for vacation, and I am trying to use up what I have on hand. That’s how these White Chocolate Banana Cookies came about. I had some leftover vegan white chocolate chips from my White Chocolate Raspberry Squares, so I thought this was a perfect way to use them up. After all, white chocolate and banana go so well together! If you can’t find vegan white chocolate chips, you can most definitely use regular chocolate chips instead. Macadamia nuts may also by another yummy option. The best part about this recipe is it has just 4 simple ingredients! 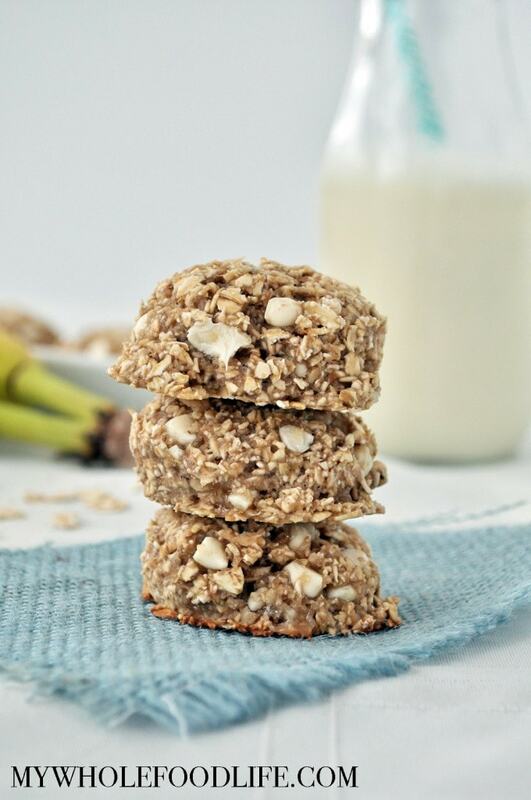 These cookies are vegan, gluten free and healthy enough for breakfast! The optional add ins are endless. I think some shredded coconut would be delish in here personally. Then again, I love all things coconut. 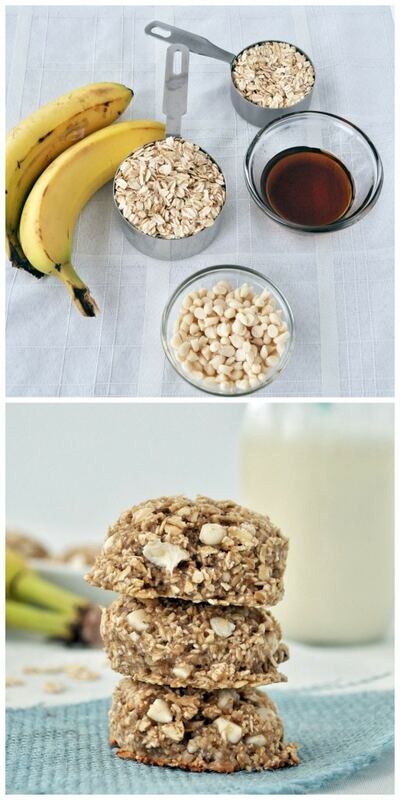 In a food processor , add the bananas and blend. Then add in the oats and maple syrup and mix well. Lastly, add the white chocolate chips, pulsing a few times to make sure they are evenly dispersed. Bake in the oven between 9-12 minutes. Let cool before removing from the baking sheet and storing in an airtight container. These should keep at least 2 weeks in the fridge and they can be frozen for up to 6 months. Enjoy! Those cookies look like they're TDF. Just add nuts, macadamia so maybe. Thanks for another great recipe from your blog. I wasn't planning on doing any baking last night, but when I saw this recipie I thought "that looks easy, quick and healthy", so I whipped it up and I'm glad I did, loved it! Moist, chewy, tasty. This one is going into regular rotation! You are so welcome Tamara!